The MTC-1500 is a spectacular presentation tool. It allows a group of up to 64 users, connected by WiFi or through your own network, to wirelessly present from their Windows or Mac computer, smartphone or tablet. The MTC-1500 is a Plug & Play presentation tool. 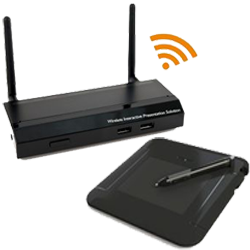 It allows a group of up to 64 users, connected by WiFi or through your own network, to wirelessly present from their Windows or Mac computer, Smartphone or Tablet. The rich feature set on the MTC-1500 make it the perfect tool for creating the perfect interactive presentation environment.